It isn’t every day that you knock down the walls of your house, only to stumble on a strange chamber behind one, which turns out to have a secret passage that leads to an entire city below the ground. But this was indeed what happened to one man when he was renovating his home in 1963 in the Turkish province of Nevşehir, in the region of Cappadocia, Anatolia. Which is how the ancient city of Derinkuyu was discovered. As a region, Cappadocia is de facto a particularly exciting place. Located on the Anatolia plateau, which elevates at little over half a mile in height, its terrain was formed by turbulent volcanic processes over the timespan of millions of years. It was these layers of volcanic ash that helped form the cone-shaped rock formations for which Cappadocia is famous. It turns out that the region is as impressive below ground as it is on the surface. 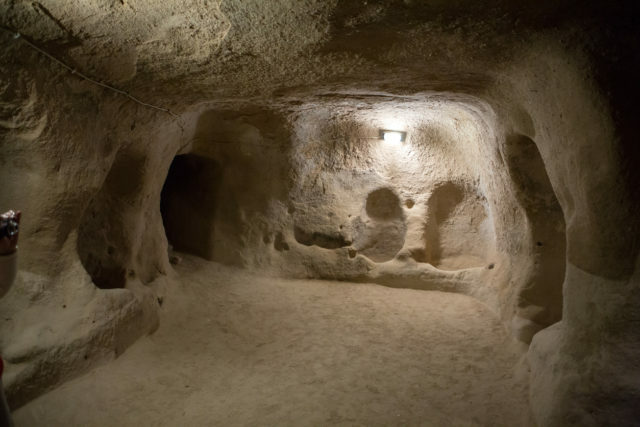 According to archaeologists, apart from Derinkuyu, there may be perhaps hundreds more settlements sleeping forgotten underneath the lands of Cappadocia, out of which six in total have been located so far. Archaeologists are not quite sure when exactly people started carving out the underground settlement. One group claims that it was the Hittites, who would have commenced with the first construction efforts of Derinkuyu as early as the 15th century B.C. 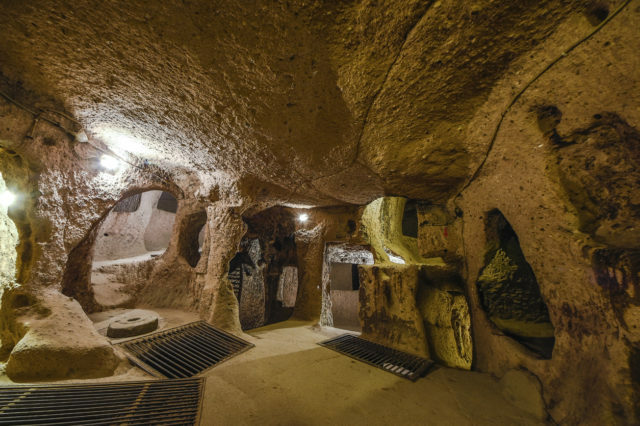 Nevsehir, Turkey – July 17, 2016:Most famous Derinkuyu Underground City in Crete on Jul 17, 2016 in Nevsehir, Turkey. Another group sets the timeline a little bit later than that, in between the 12th and the 8th centuries B.C., suggesting that it was the Phrygians, adversaries of the Hittites, who built the underground city. Some sections of the settlement are believed to have been built later on, during the Byzantine era. Nevertheless, the voids and carvings of the rocks were not only great for storing food because they could keep a constant temperature, but were also superb for offering shelter in an area that frequently was the subject of foreign invasions and raids. The Greek philosopher Xenophon of the 4th century B.C. is one of the first to provide written accounts of the people who thrived in this part of Anatolia. He remarked that they lived in homes excavated below ground level, large enough to accommodate whole families, as well their livestock and food resources. 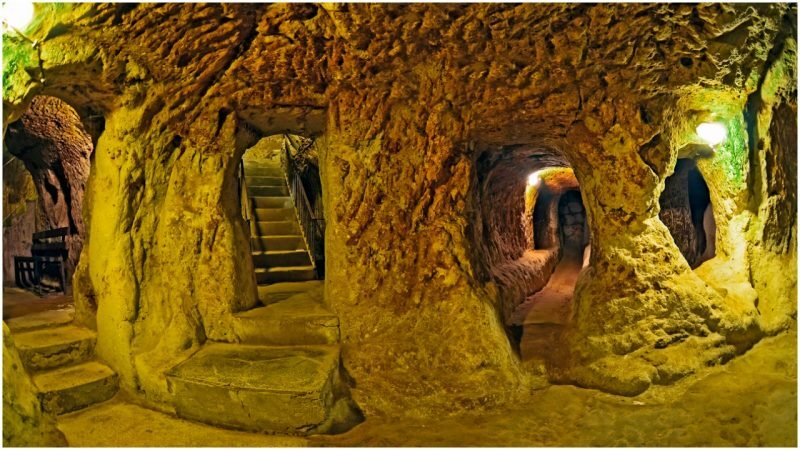 Derinkuyu is one great example of these underground cities. It extends as much as 250 feet into the depths of the earth and was designed to offer shelter for roughly 20,000 people. Multi-layered, this subterranean city contained everything its people needed in times of trouble. Only eight levels can be accessed nowadays, and here, archaeologists and researchers have stumbled on all kinds of dwellings: kitchens and separate facilities for storing food, or oil and wine; bathrooms and rooms for sleeping. Bigger structures which are assumed to have had practical uses for larger groups of people have also been found. Even the smallest voids in the rocks found use, most usually as tombs. If you wonder how did they breathe down there, they had an intelligent system composed of dozens of ventilation shafts that brought the air from the surface, after which, thousands of smaller tubes distributed it all over the settlement. Water? An underground river made the perfect resource of drinkable water, which was distributed all around via a basic irrigation system. Protection measures inside Derinkuyu were well in place too. Its ancient architects made use of big doors made of stone, arranged in a way that enabled each level to be sealed on its own in case an immediate threat was on its way. 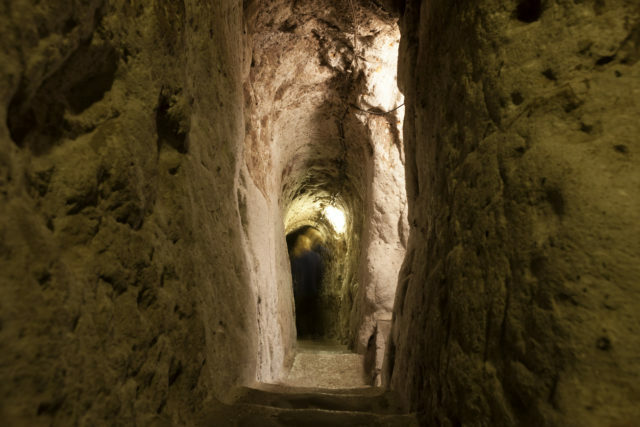 Furthermore, escape routes have been found on each level, which would have enabled the people of Derinkuyu to run away in case some unprecedented event unfolded around. 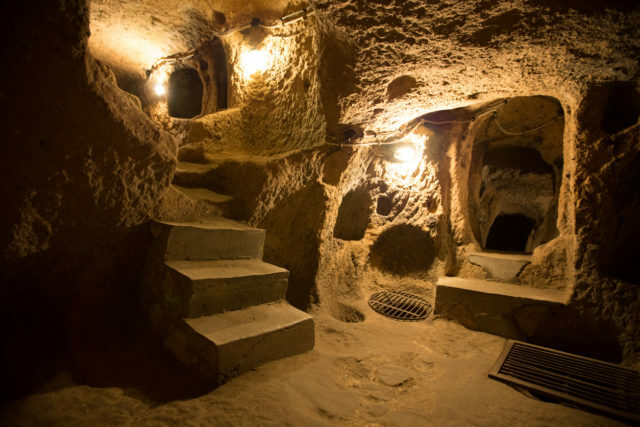 Last but not least, there is a nearly five-mile-long passage that connects this underground city with another one, Kaymakli, which is perhaps the largest of all in Cappadocia. That suggests a possible collaboration between the two distinct communities. From all the evidence, it is clear that Derinkuyu’s inhabitants, whoever they were, had designed a city where they wouldn’t need to rely on anyone but themselves, and where life can go on as normally as if they were living on the surface. Six years after Derinkuyu was discovered, it was opened to the public. Only around 10 percent of it can be seen by those who come to visit, but going there definitely seems worth it.